Lighting - Hanging Lanterns and Oil Lamps Page 2 Hanging lengths can be adjusted by shortening or lengthening the chain. An Arts and Crafts copper and brass conical lantern with original Vaseline liner. Dimensions: H14', W6.5', D 6.5'. A good Arts and Crafts gilt and brass lantern with a swirl Vaseline shade and radiating floral leaf decoration to the top suspended with three support rods running through the leaves joined by chains to the top. Height including chain 33 1/2", Width 12 1/2", Vaseline Shade Height 9". Circa 1900. A Glasgow school anodised copper ceiling light with upside down split heart cut-outs to the top and little repousse split hearts just above the glass. Height 16", Width 6 1/4". Circa 1895. Brass lantern with subltle bronze tinged shade and whiplash swirl blown into the glass liner. Height of Lantern 10", Height of chain which can be adjusted 15", Width 8". Circa 1890. A little Arts and Crafts copper lantern with conical hat and crimped edge with stylised lower section and original Amber swirl liner. Height 7", Depth at base 5". Circa 1900. A good set of three Arts and Crafts hand hammered conical shaped ceiling lights, with ruby glass liners. Height 7", Width of base 5". Circa 1900. A pair of Arts and Crafts hand hammered lanterns, with flaring base, inset with eight Ruskin hearts, two to each side and leaded glass. Height 9 1/2", Width of base 6". Circa 1900. 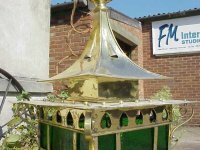 A little Arts and Crafts brass lantern with conical hat and original opaque liner. Height 7", Depth at base 4". Circa 1900. A little Arts and Crafts brass oil lamp on a gimbal so it can be used on a wall, on a table or ideal for a boat. Height 6", Length of leaf 6", Width 4 1/2". Circa 1900. 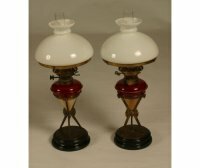 A rare pair of signed Moorcroft Mcintyre oil lamps in Period Aesthetic Movement brass stands. Height 23", Width of base 7 1/2", Width oil lamp 6 1/2". Circa 1875. 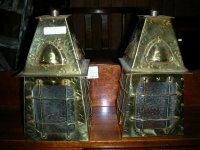 A pair and one other Arts and Crafts Brass lanterns with riveted wire details protecting the glass and riveted heat vents to the pyramid tops 2 polished, 1 unpolished. Height 10", Width 5". Measurements of the single Height 9 1/2", Width 5". Circa 1900. An Arts and crafts copper lanten with hand formed hand hammered finish and original opaque shade. Height 10", Width 8", chain length 10". Re-wired and ready to use. Circa 1900. A brass ceiling lantern, hand formed with a Vaseline glass liner. Re-wired and ready to use. length 10", Width 5". Circa 1900. Gardners, The Strand. London. A high quality oil lamp with a hard paste porcelain resovoir hand painted with delicate fruiting berries and foilage, embraced by three large Gilt bronze cat pillars with terminating with paw feet. The oil reservoir and burner slide out in one. With it's original Hinks and Sons burner. 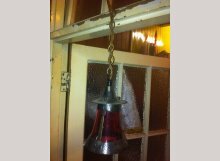 An Arts and Crafts copper hanging lantern, with little latch style hand made handle to allow easy acces to change the bulb. Height 15", 8" square, copper rod length 9". Circa 1905. 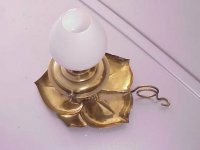 A Brass electric ceiling light with it's original Vaseline liner. An Arts and Crafts copper lantern with stylised floral details to the top and vibrant coloured glass. An Arts and Crafts brass Lantern in the style of CFA Voysey with heart cut-outs to each side and a scroll detail to each corner, the top in the form of a Chinese Pagoda with stylised leaf detail around the top loop. Height 20 ", 14" Square. Circa 1890. Left :- An Arts and Crafts copper and Vaseline lantern with pierced hearts to the top and pierced disc details riveted to the top and splayed rivet details to the bottom. Right :- A matching smaller Arts and Crafts lantern of similar style with an opaque glass conical liner. A Arts and Crafts copper Lantern with original vaseline liner. Height 14 1/2", Width 8". Circa 1900. A little Arts and Crafts conical iron lantern and original Vaseline liner in the style of The Guild Of Handicraft. Height 10", Depth at base 4". Circa 1900. An Arts and Crafts lantern with shaped opaque glass to the main and a deepish cobalt blue to the top all hand blown glass. The Lantern is hand hammered with cold riveted construction. The copper is a original chocolate finish. Height 13 1/4" Width at flaring roof 10 1/4" Width at base 7 1/4".